The exhibit also makes use of two showcase displays to highlight examples of a variety of drug paraphernalia and meth-related items. “This innovative exhibit is designed to raise awareness on many levels – addiction, detection, recognition, treatment and, we hope, prevention,” said Sgt. Josh Lawson, commander of the KSP Public Affairs Branch. 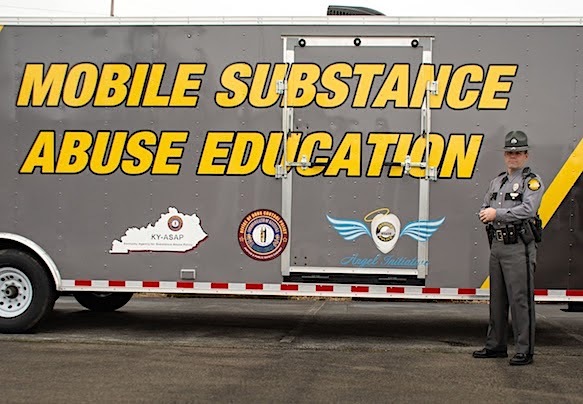 The mobile exhibit is now available for use by schools, clubs, civic organizations, businesses, churches, local governments and communities throughout the state. To schedule the display, contact the Public Affairs Officer at the KSP post closest to your location or call the KSP Public Affairs Branch at (502) 782-1780.